Will Huawei's new flagship cut the mustard? Images have now appeared online claiming to show the much talked about Huawei Ascend D2 in all its 5-inch glory. Just this morning we reported that a Huawei executive confirmed the Ascend D2 would be arriving at CES 2013, alongside the Windows Phone 8 touting Ascend W1. 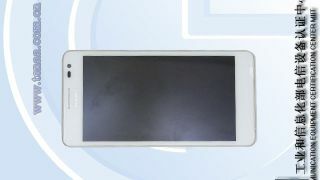 The photos come courtesy of China's version of the FCC, which posted three snaps of the device on its website, showing a minimalist white handset with no buttons on the front and an HTC One X style camera on the rear. The key feature on the Ascend D2 is its full HD, 5-inch display which will see the handset go up against the likes of the Samsung Galaxy Note 2 and HTC Butterfly/Droid DNA in the super-sized phone market. Some specifications accompanied the photos, which apparently shows the Ascend D2 weighing in at a hefty 170g, measuring 140x71x9.9mm and packing a decent 2,900mAh battery. We're yet to hear anything official directly from Huawei, so we are not getting carried away with these latest reports, but it's all looking pretty good at the moment for the Chinese firm.